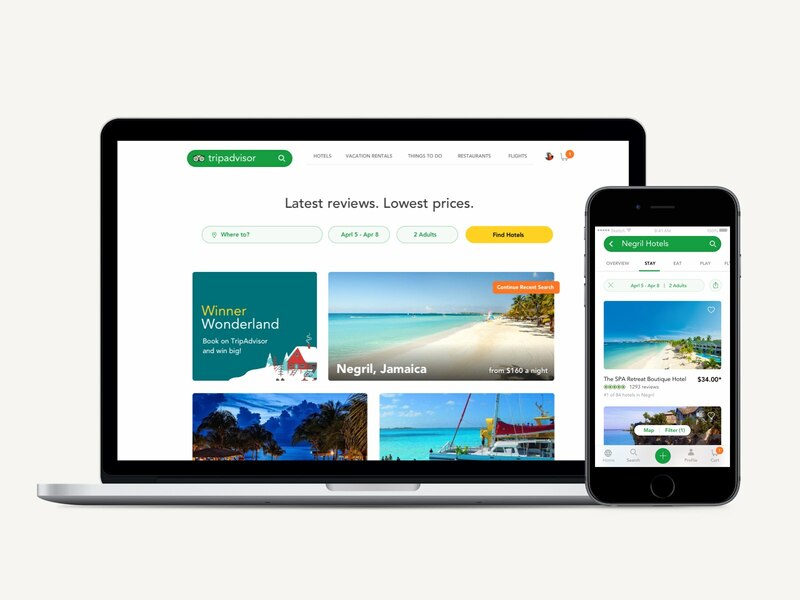 TripAdvisor Design Vision 2016 – NATCo. In 2016, having been embedded on the following teams: Personalization, TravelGuides, User Engagement, and Tours & Tickets, I was inspired by many of the discoveries we uncovered around our users and the travel business. 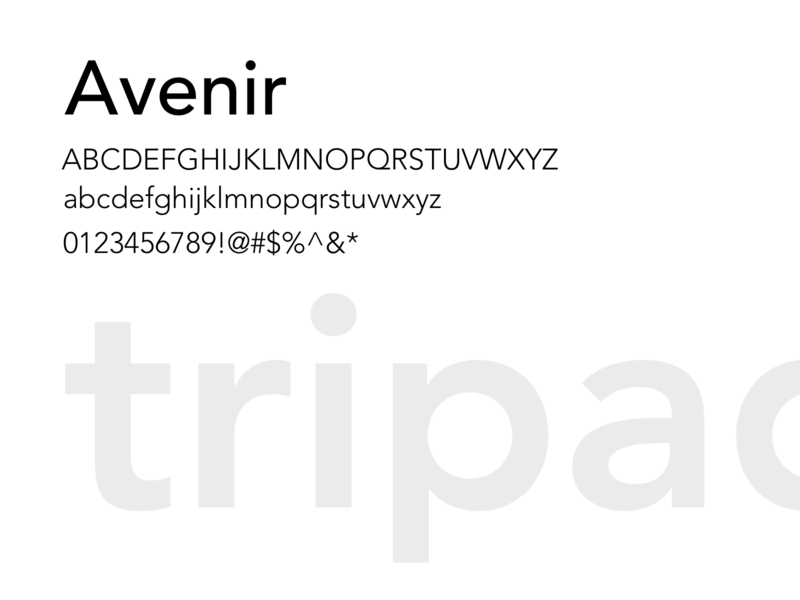 I presented the following vision document to my colleagues, outlining strategies for the future of the TripAdvisor brand and product experience. The product footprint was wide, yet the overall architecture – vertical. 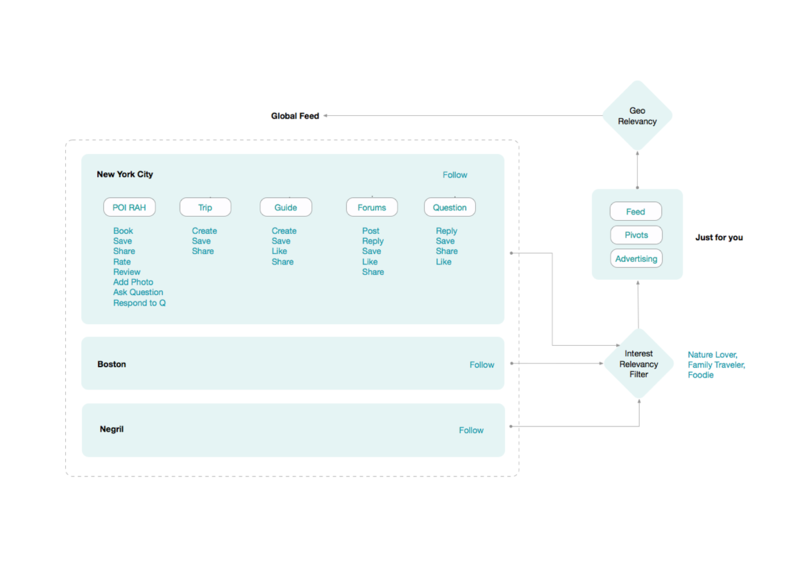 We needed a way to bring many of the existing features together across the business units, and optimize the ux for travel planning behaviors. As a company our success hinged on the ability to transform from an index of travel listings, typically discovered via google search, to a consumer’s go-to for planning an booking travel. We’ve talked to consumers who find these features helpful. The product is extremely efficient in task based interactions like searching and receiving a list of activities in a city. Travel is more than this and by leveraging the brand’s unique roots in social and community engagement, we would be able to tell a story, page by page, keeping our users coming back, booking, discovering and sharing items in their personalized travel feed. 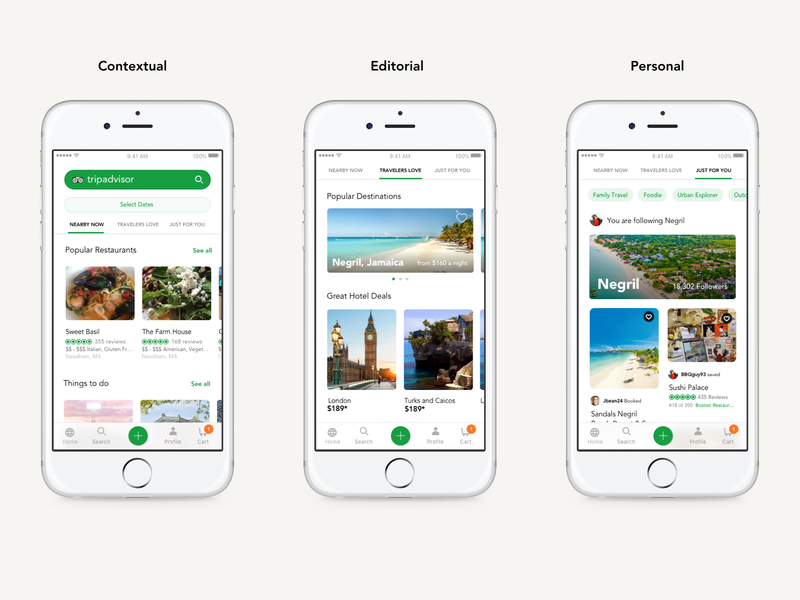 Streamline user experience and re-architecture the TA product hierarchy to better leverage TripAdvisor’s vast yet fragmented digital experience. Provide a consistent, contextual experience across all pillars and platforms. Create a memorable and engaging user experience that assigns appropriate focus in the UX, based on the traveler lifecycle journey – planning, booking and in market experiences, all while better utilizing our existing machine learning engine. 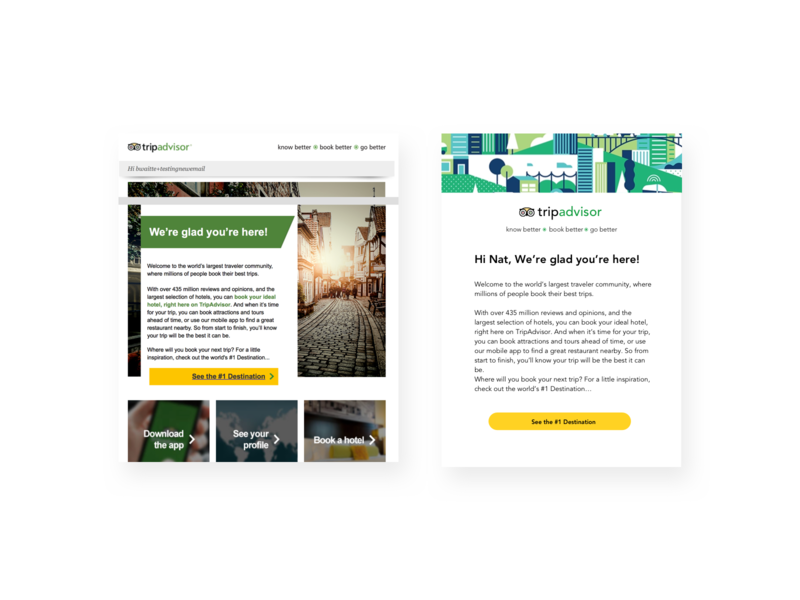 Give booking higher visibility through prioritization in navigation and through the introduction of a cohesive visual language that supports a shopping marketplace vibe. True to our roots, through a highly personalized contextual social layer, re-enforce booking awareness in app and through dynamic output to social media. Spawn a new era of highly targeted contextual ads, personalized CRM and sponsorship opportunity. 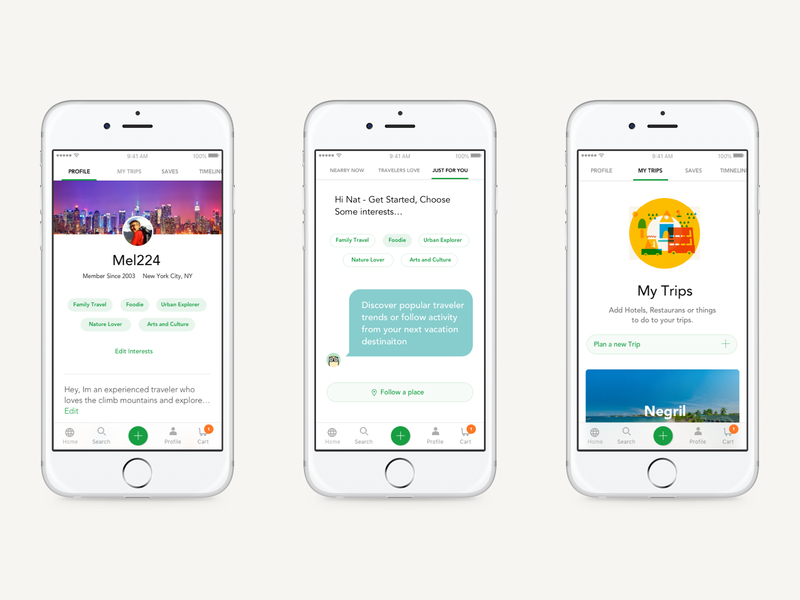 Bring our brand and mascot to life as a trusted travel sidekick able to connect with consumers through chat apps and in connected homes or automobiles. From our user research and testing we found that travelers tend to think broadly about a destination before jumping into booking. 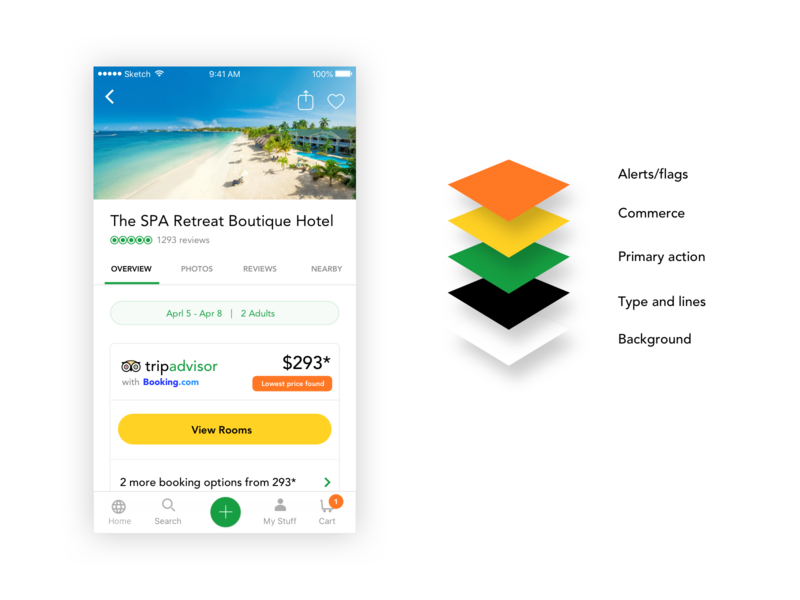 Rather than sticking to business units in determining a UX ( hotels, restaurants, attractions, flights), the re-design provided a destination centric hierarchy where users could intuitively plan a trip around personalized criteria. Context, Discovery, Inspiration…A user opens the app to find the home screen populated with information about the location they are currently in. The navigation is tabbed to allow a user to discover contextual or global promotions and popular offers. Lastly a user has the opportunity to create a highly personalized experience. 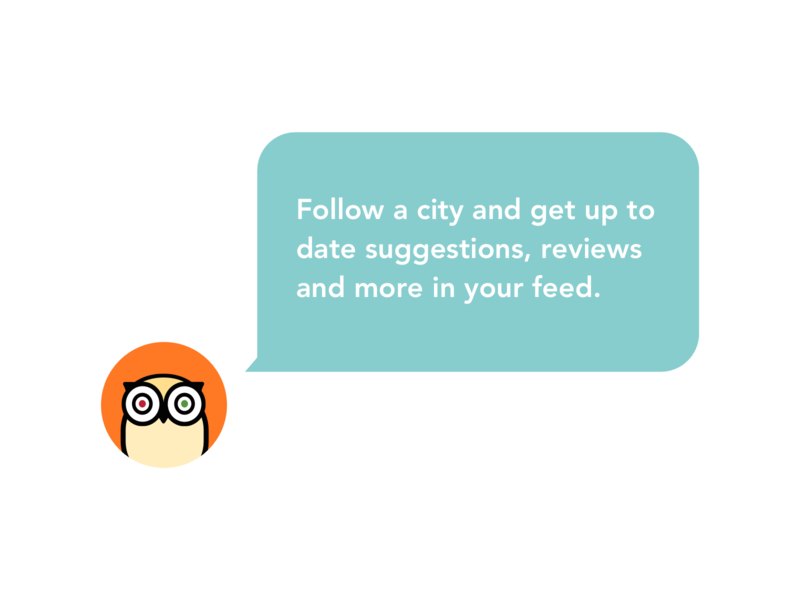 By tagging their profile with interests or following a city, they can browse a feed of content from that location as they plan their upcoming vacation. 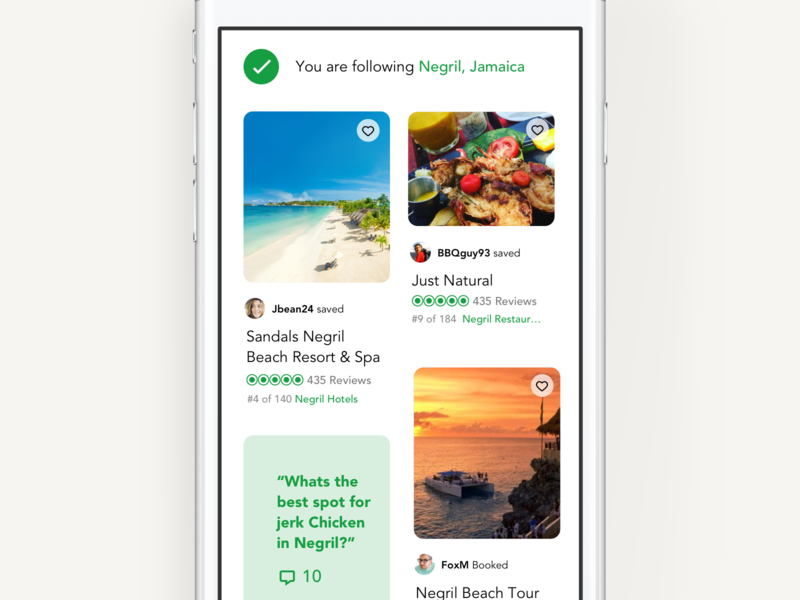 The app is organized by geographic locations containing hotel listings, restaurants, activities and flights.At this level in the IA, a user can click to follow the city for updates and reviews in their feed. 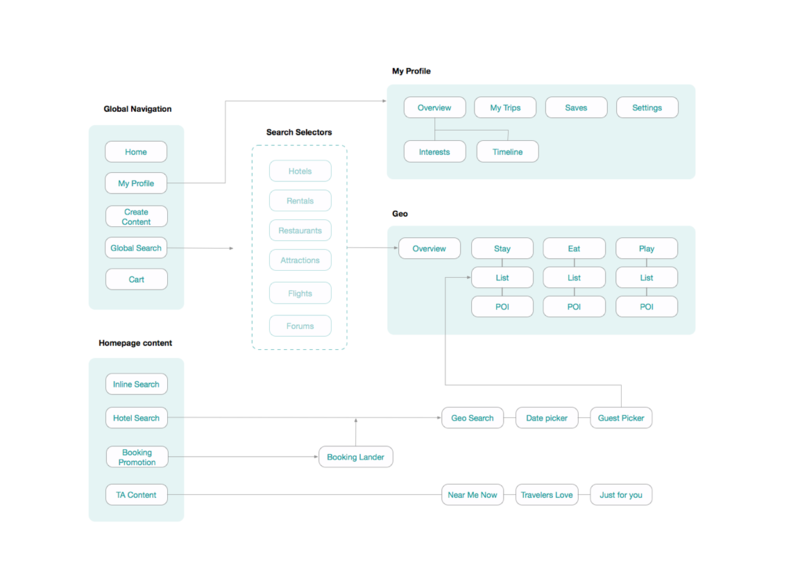 While working on the personalization team, I was inspired to map a “relevancy engine”. This logic would help TripAdvisor’s evolving machine learning algorithms to contextually populate users’ inspiration feeds. 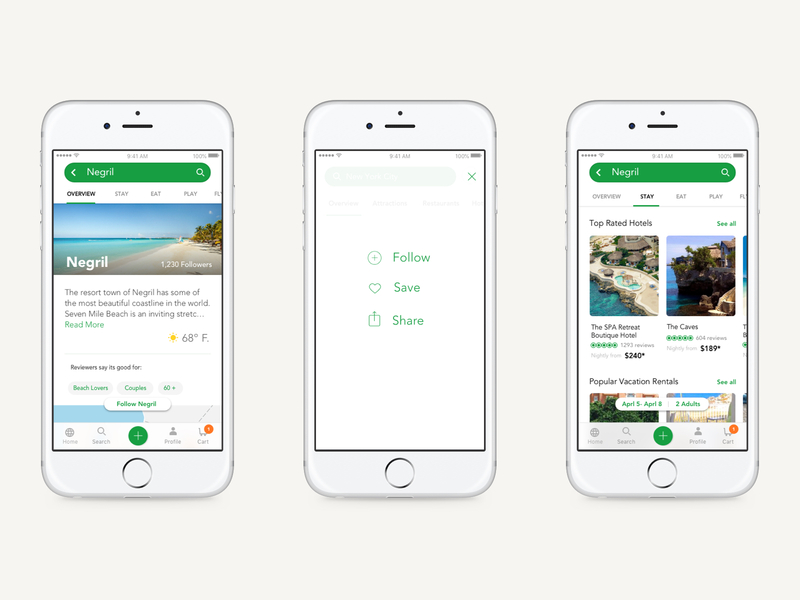 Users self select interests and follow both user-generated and editorial TripAdvisor content. 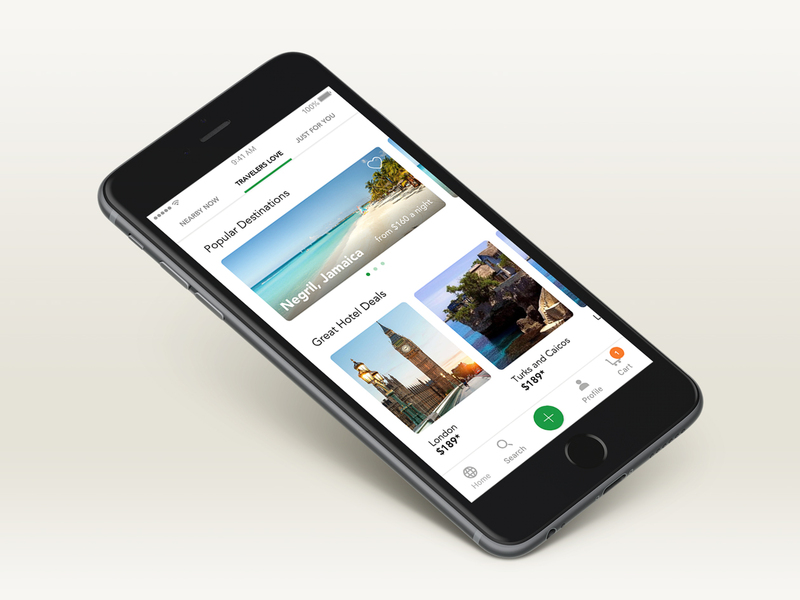 Engaging with the app, we build a relationship with the traveler who is then able to plan and book better at each phase of their trip: pre-, in- and post-trip. To build trust with users and craft better ux patterns, the brand required a refreshed visual language. 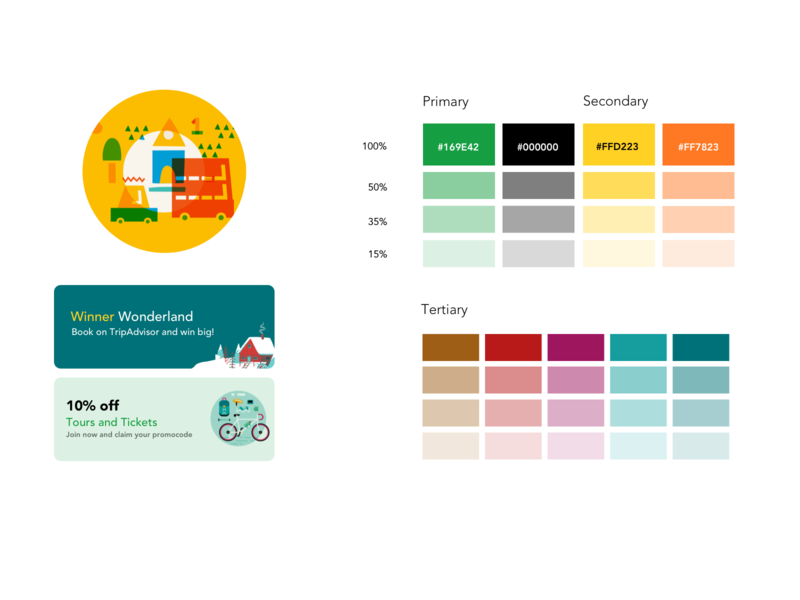 The concept included tweaks to the company logo, updates to our color palette, rules on color usage, a new brand font, and the introduction of branded illustrations. Keeping users engaged. An example of a redesigned email. Clean, simple and clear.